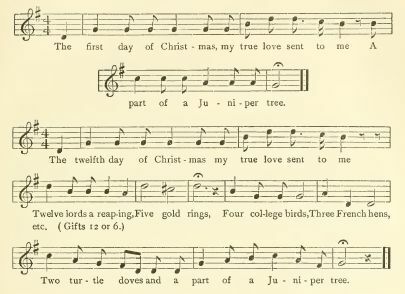 Excepted from an article "Some Traditional Songs"
Source: Philip Barry, "The Twelve Days of Christmas," from "Some Traditional Songs" in The Journal of American Folk-Lore, Vol. XVIII, No. LXVIII. (American Folklore Society ; Boston: Houghton Mifflin and Company, January-March 1905), pp. 56–59. Song IV. The Twelve Days of Christmas. Mentioned among the Allen Songs as a Christmas carol, it is, however, neither a Christmas song nor a carol. Mrs. Gomme (Traditional Games, vol. ii. p. 319) gives the best account of it, showing that it is originally a game, bearing some resemblance to the game of "Forfeits," and connected with the festivities of the Epiphany. " The company were all seated round the room. The leader of the game commenced by saying the first line. 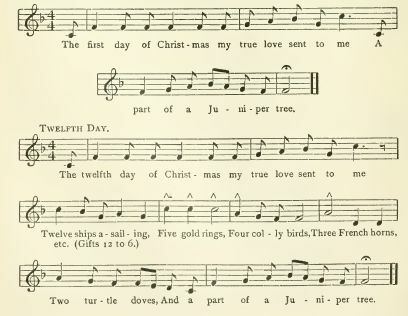 The lines for the first day of Christmas were said by each of the company in turn, — then the first day was repeated, with the addition of the second by the leader, and then this was said all around the circle in turn. This was continued, until all the lines were said all round the circle in turn. For every mistake, a forfeit had to be given up." A part of a juniper tree. Two turtle doves, and a part of a juniper tree. From the same source as the version of "The Elfin Knight," cited on a previous page, I have the following set of the words and air of this game-song. 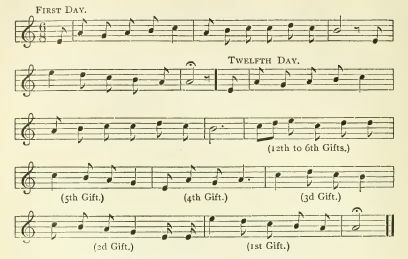 Editorial note in The Journal of American Folk-Lore: The pamphlet from which are taken the four songs above given is entitled "Family Songs, compiled by Rosa S. Allen, Music arranged by Joseph A. Allen. As sung by the Aliens at the Homestead, Castle Hill, Medfield, Massachusetts, 1899." Pp. 14. 3. Blow, ye Winds, Blow. 6. The Ram of Derby. 7. Song of a Hunter. 8. A Frog he would A-Wooing go. 10. When Adam was First Created. 11. The Twelve Days of Christmas. This little collection, which includes examples of some ancient ballads, may serve as illustration of the considerable body of folk-song still existing in all parts of the country, and awaiting collection.